As I have mentioned before when discussing vaccinations, I am not a medical doctor or an herbalist, but when my children are sick, I reach for Herbs for Kids. 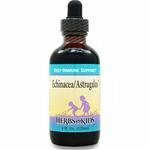 Herbs for Kids are liquid tinctures that children readily take. Unlike tinctures made for adults that have a grain alcohol base, Herbs for Kids uses sweet glycerin to preserve the medicinal qualities of the plants. Not only are Herbs for Kids alcohol-free, but they are specially formulated for children, including the appropriate dosage. Founded by herbalist Sunny Mavo, Herbs for Kids is “the first company dedicated to Earth-reviving herbal health care for children”. My husband and I love these tinctures so much, that we use them for ourselves as well. Our medicine chest is always stocked with the Echinacea and Astragalus, the Cherry Bark Blend, and the Elderberry Syrup. It is important to note that herbs preserved in glycerin have a shorter shelf life than those preserved in alcohol. Glycerin tinctures are good for approximately one year. Cold and flu season are in full force, and Herbs for Kids makes it easy to treat your child naturally and easily. My family could not live without these products, and Herbs for Kids is not just for children! These products are safe, but it is always good to consult with a doctor or a herbalist if you have any questions or concerns. I use them too for our kids. I feel so much better giving them herbs than medicating them all the time. I just came across the Elderberry drops and so far they are working great. Good review. I have been researching products for my children. At NutritionalTree.com, there are a lot of customer reviews of products like this (not this one), and some of them seem very effective while others are clearly not.